Keeping track of Agile projects can be equivalent to herding cats, which is why it's very helpful to see what others choose as tools. VersionOne asked respondents which were their go-to Agile project management tools and they were allowed to give multiple answers. 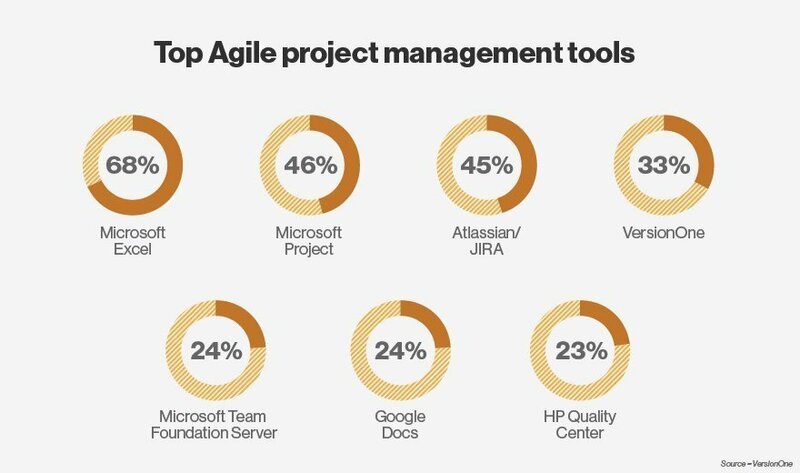 Microsoft offerings are three of the top five most popular Agile management tools. Sixty-eight percent of companies use Microsoft's Excel spreadsheet, while 46% use Project and 24% use Team Foundation Server. But the survey allowed responders to choose more than one tool and to write in other choices. Popular "write in" project management tools included AgileFant, FogBugz, Mantis, Redmine, SharePoint, Trac and Trello. Interestingly, 19% of respondents said they use "in-house" or "home-grown" tools, and that was the same percentage of people who use Bugzilla. Another somewhat surprising option was Google Docs -- 24% of people use that free and easy-to-use tool to manage their Agile projects. What Agile project management tools does your organization use? I'd love to know whether this question gave a huge list, or if people had to call out what they used. Some of these tools don't exactly scream agile at me. I mean... Microsoft Project and Microsoft Excel? Maybe this is more a matter of names that are known. We use Rally. It's ok. It's more than we need. We have also used LeanKit and Pivotal Tracker, which we liked, and are also much more inexpensive that a massive application like Rally. We used Jira in one project, and MS Team Foundation Server in another one. It's more a matter of doing Agile right rather than using right Agile tools. I would also recommend to try ganttpro.com. Do you know it?